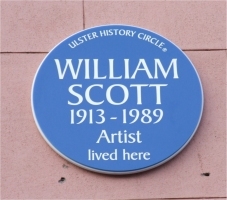 William Scott was born on 15 February 1913 in Greenock, Scotland. 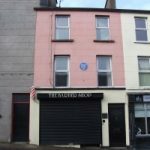 His family moved to Enniskillen when he was eleven. He was educated at the Model School and attended night classes in art at the Technical School, under Kathleen Bridle. He studied at the Belfast College of Art in Belfast in 1928. He won a scholarship to the Royal Academy School, London where he won a silver medal and in 1934 became a Landseer scholar in painting. He was awarded a Leverhulme scholarship in 1935. 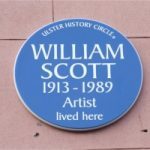 During the early years of the Second World War Scott helped to run an art school in France and from there went to live in Dublin and then London. From 1942 to 1946 he served with the Royal Engineers, and learned lithography in the map-making section. 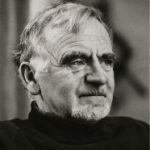 From 1946 to 1956 he taught art at Bath Acadamy of Art and from there went to Canada and America as a guest instructor. Scott exhibited in London, America, Italy, Switzerland, West Germany, France, Canada and Australia, as well as Belfast and Dublin. 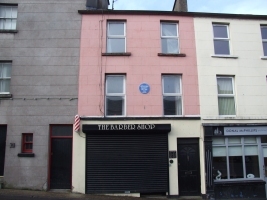 In 1961, he executed a mural for the Altnagelvin Hospital, Londonderry. 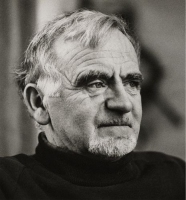 He is represented in many collections at home and abroad including the Tate collection, the Ulster Museum, the Scottish National Museum of Modern Art and the Guggenheim Museum. Scott was an internationally recognised artist, representing Britain abroad. He was appointed CBE in 1966 and received honorary doctorates from the RCA, QUB and TCD. He was elected RA in 1984. He died in Coleford, Somerset on 28 December 1989.